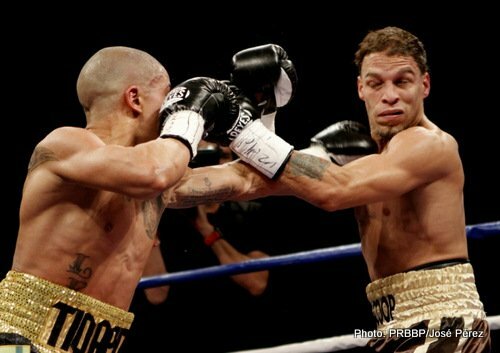 By Dwight Chittenden: Former WBO super bantamweight champion Wilfredo Vazquez Jr. (22-2-1, 19 KO’s) got off to a slow start in the early rounds but then really came on to batter Jonathan Oquendo (22-3, 15 KO’s) and stop him in the 7th round on Saturday night in a crucial fight for the 28-year-old Vazquez Jr. at the Coliseo Ruben Rodriguez, in Bayamon, Puerto Rico. Vazquez Jr. was dominated in the early rounds, but suddenly he started coming on in the 5th with his big power shots and eventually stopped Oquendo in the 7th. The referee then stopped the fight at 2:33. 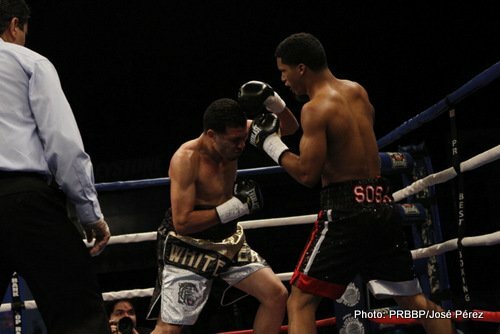 The victory keeps Vazquez Jr’s title hopes alive. 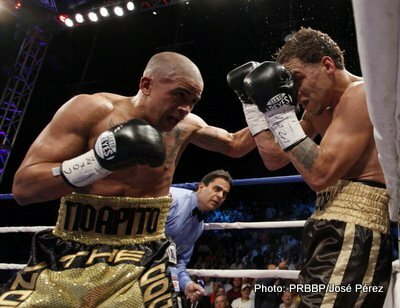 Ranked #8 WBO, Vazquez Jr. suffered recent losses to Jorge Arce and Nonito Donaire. He did give Donaire a lot of problems in losing, but the loss still hurt none the less. 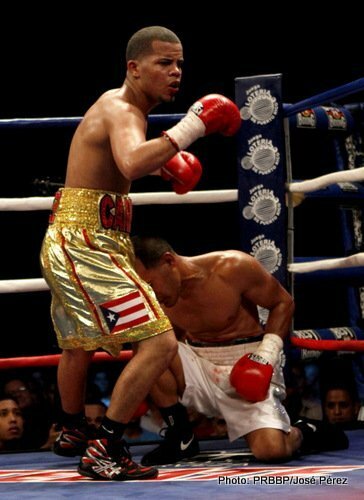 WBO minimumweight champion Moises Fuentes (16-1, 8 KO’s) was simply too much for former WBO minimumweight and WBO light flyweight champion Ivan Calderon (35-3-1, 6 KO’s), stopping him in the 5th round after knocking the 37-year-old Calderon to the canvas three times in the round. 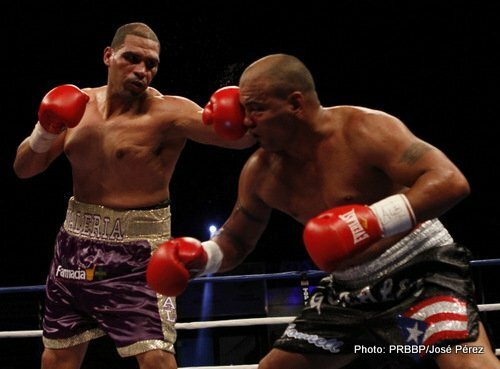 Fuentes took a page out of the playbook created by Giovani Segura in his wins over Calderon by trapping him against the ropes and punishing him with heavy power shots to knock him down repeatedly in the 5th. Calderon did fight well for the first three rounds, but it was clear even then that he couldn’t run forever and would eventually get taken out. WBO Latino lightweight champion Jose A Gonzalez (21-0, 16 KO’s) showed impressive power in destroying a badly overmatched Oscar Cuero	(15-8, 12 KO’s) by a 1st round stoppage. 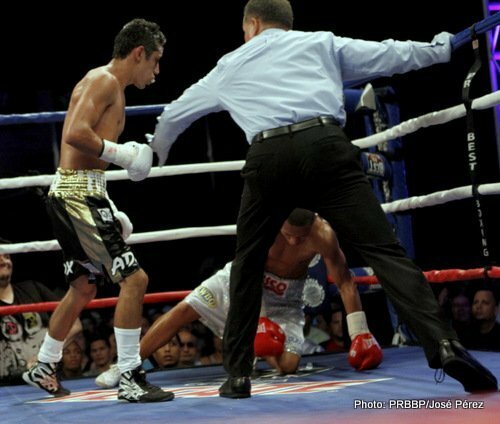 Gonzalez knocked Cuero down two times in the round with hard body shots to get the stoppage at 1:54 of the round. Gonzalez is ranked #4 WBO and would be a great choice for WBO lightweight champion Ricky Burns’ next fight on December 15th. He’d likely give Burns a lot more problems than his last several opponents Kevin Mitchell, Paulus Moses and Michael Katsidis. Heavyweight Victor Bisbal (21-1, 15 KO’s) bludgeoned Alex Gonzales (20-8 10 KO’s) into submission in a 6th round TKO win.